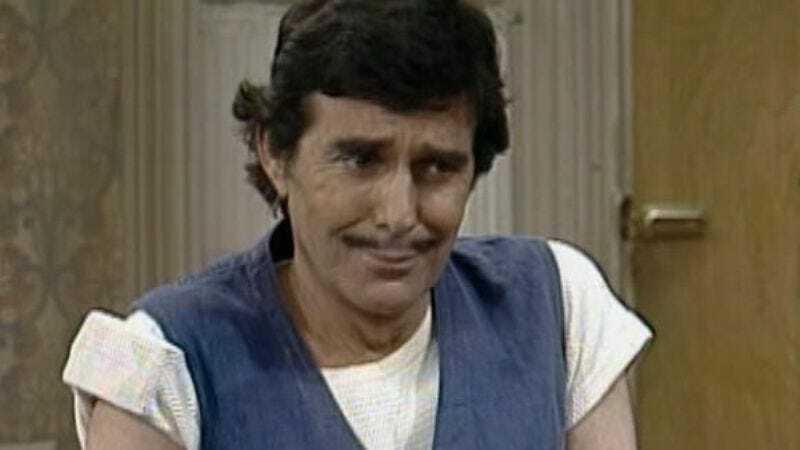 Pat Harrington Jr., best known for playing building super Schneider on One Day At A Time, died January 6 at the age of 86. His daughter, Tresa Harrington, shared the news of his death on Thursday morning, and TV Line reports the actor had suffered from Alzheimer’s. Harrington was born in New York City in 1929. His father, Pat Sr., was a former vaudeville worker and Broadway performer. By 1950, Harrington had obtained bachelor’s and master’s degrees from Fordham University, and went on to serve in the Korean War as a United States Air Force intelligence officer. Like his father before him, Harrington pursued a career in entertainment; he toured with a theater company and performed on Broadway. Harrington broke into TV on The Steve Allen Show as Guido Panzini in the recurring “Man On The Street” sketch that also saw Don Knotts play a nervous weatherman. The character, an Italian golfer, was a hit with audiences, and Harrington was able to reprise the role on Laugh Line, The Jack Paar Show, The Man From U.N.C.L.E, and McHale’s Navy. From 1959-1960, Harrington appeared on the Danny Thomas-led sitcom Make Room For Daddy, and in the ’60s, he guest starred on multiple programs, including The Bing Crosby Show, Kentucky Jones, and F Troop. Harrington’s roles were so varied that in 1967, he went deep-sea diving with Elvis Presley in Easy Come, Easy Go, as well as voiced Ray “The Atom” Palmer in The Superman/Aquaman Hour Of Adventure. But it was in 1975 that Harrington landed his most memorable role—that of Dwayne Schneider on Norman Lear’s groundbreaking sitcom, One Day At A Time. Harrington played the building super who assumed a little too much familiarity with Ann Romano (Bonnie Franklin), a single mom with two teenage daughters (Mackenzie Phillips and Valerie Bertinelli). By series end, Schneider was a true friend to the family, and Harrington had won an Emmy and Golden Globe for Outstanding/Best Supporting Actor in a comedy. Here he is setting his nephew, played by Mark Hamill, straight on stealing from his tenants. Harrington eventually racked up guest spots on everything from The George Carlin Show to the Fantasy Island revival; he also recurred on The Love Boat and Murder, She Wrote, the latter of which saw him play three different characters. His last TV appearance, as Mr. Sherden on Hot In Cleveland, reunited the actor with his One Day At A Time co-star, Valerie Bertinelli.